LINO CARVING TOOLS - Ideal for carving linoleum, Speedy Cut, Speedy Carve, other hard and soft substrates. Great for detailed pumpkin carvings. ASSORTED SIZES - This linoleum cutter kit contains (1) each of the following: #1, #2, #3, #5, #6 lino cutters. There is a size for every job. INCLUDES HANDLE - Each order includes a red lino handle. It is made from hard plastic, with a comfort grip. The removable end is perfect for storing the linoleum cutters. QUICK TO CHANGE - The hand-adjustable metal chuck makes changing out lino cutters super fast and easy. The twist off handle offer convenient storage. 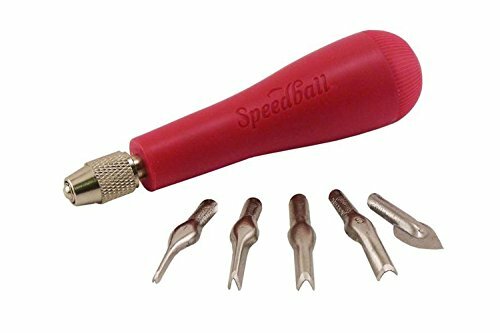 MADE IN THE USA - The Speedball Linoleum Cutter Assortment #1 is designed and made in the USA. By Sasaki solder industry co., Ltd.